Last week, the FDA announced new concerns regarding the use of Benzocaine in children. Benzocaine is used as a topical anesthetic and is the primary ingredient in Orajel and many of its competitors. Evidently, benzocaine use has been linked to the development of methemoglobinemia. When children developed methemoglobinemia, they produce a type of hemoglobin that is unable to deliver oxygen to the bodies tissues. Severe cases can lead to death or brain damage. Most of benzocaine related cases have involved children under two years. 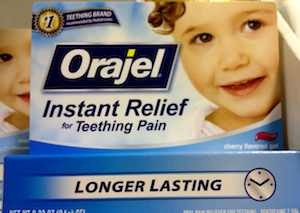 For this reason, I no longer can recommend Orajel (or other benzocaine containing products) for relief of teething symptoms.